F&W has published more recipes than we can count from Jacques Pépin over the years. This recipe for 10-second tart dough is one of our favorites. We've published more recipes than I can count from Jacques Pépin over the years, and I have an arsenal of favorites. This recipe is the one I've copied for friends the most. 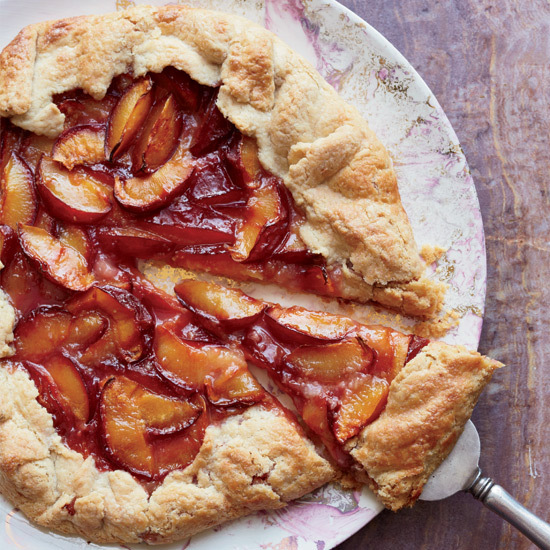 It's a fantastic plum galette, with juicy fruit and a super crisp, super buttery, puff pastry-like crust—but it's the pastry that's magical. I'm not an amazing baker, but when I make Jacques's pastry dough, I feel and look like one. This recipe has made everyone with whom I've shared it feel the same way. It's easy to make in a food processor—it takes just 10 seconds to come together and it's ready to roll. I've used it for other fruit tarts (like rhubarb, peach, fig, blueberry, apricot-raspberry, apple and pear-chocolate), alternating the ground nut and sugar mixture to complement the fruit and soak up the juices on the bottom. I've made savory galettes with it—potato/thyme and Gruyere, butternut squash and tomato, mushroom and Swiss chard. I've made big galettes, small tarts and hand pies. You can also roll it out and sprinkle it with seeds, or parmesan, or cinnamon sugar, to make savory or sweet crackers. You just have to believe Jacques when he says to process the pastry for no more than 10 seconds, and be sure to bake it until crisp and browned for the easiest, flakiest pastry you'll ever make.